Gary Daniels is Major Anthony Strong of the SAS - and he must deliver an important message to the British Ambassador in Kazakhstan, Sir Desmond Grey (Westhead), who will then deliver it to the President of Kazakhstan, Kasym (Georgi Gasov). This crucial suitcase handcuffed to his arm can only be trusted to the most elite of special ops, in other words, a “Queen’s Messenger”. Along the way he must fight off an unending stream of thugs and baddies. But the kicker is evil terrorist Ali Ben Samm (Waltz), who is described as a “Saddam in waiting” and leads the so-called “revolution of the faithful”, also wants Strong dead. So he then unleashes his army of “Motorcycle Muslims” as they are called (and probably wouldn’t be called today). Along for the ride is “ZNN” reporter Alexi Jones (Donovan) and her wacky cameraman Klaus (Ivanov) - the love interest and the comic relief, respectively. Can Captain Strong battle his way through wave after wave of baddies and accomplish his task? 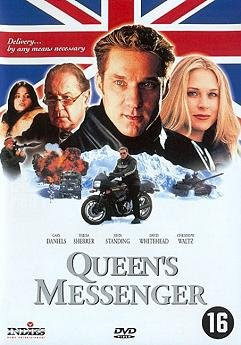 The first in a two-part series of Anthony Strong films (the other being Witness to a Kill, 2004), strangely Queen’s Messenger was not released in the U.S., but Witness was. That’s unfortunate for Daniels fans who aren’t as intrepid as we are, because Queen’s Messenger is quite competent, with well-staged stunts and fights. Daniels is charming, and he plays the epitome of cool as the motorcycle-riding, sunglasses-wearing Strong. The name “Captain Strong” is said many, many times throughout the film, and as a showcase for Daniels’ talents, it’s..well...strong. Try to imagine some sort of cross between The Transporter (2002), Special Forces (2003), and The Peacekeeper (1997) - the latter especially comes to mind because he MUST deliver the suitcase at all costs! Both he and Major Frank Cross (Dolph’s name in Peacekeeper, as if you didn’t know...coincidentally also a Major) have unbelievable tenacity. While any normal person, after the FIRST bad guy trying to kill you, would have said “that’s it, I’m outta here”, Cross and Strong battle through an army to get the job done. They should really get employee of the month. Christoph Waltz raises the level of his fairly one-dimensional bad guy, and he has the same problem Robert Miano has had in the past - try to play a Middle Eastern terrorist if you’re not Middle Eastern. Interestingly, references are made to Saddam Hussein’s weapons of mass destruction, showing that in the pre-Iraq War year of 2000, the world really thought he had them. That aside, there is a tank chase, which you don’t see every day, and plenty of missile launchers in play. Plus it’s different to see Gary Daniels romping around in the snow. Listed as a Canada-UK-Bulgaria co-production, it does have that bleak Eastern European look to it which fans of any low-budget movies of the last ten years or so are familiar with. At least the movie is set in Kazakhstan (I’m not going to make any Borat jokes), and not “New York” or “Los Angeles”. Gary Daniels fans will find a lot to like with Queen’s Messenger. It remains in question whether anyone else would get much out of it, but it’s reasonably entertaining, if a bit by-the-numbers. I perrty much agree with you on this one, only I thought it should've called it quits at the 75 minute mark, when the film met a more natural ending. It is strange though that this wasn't released in the US, but Witness was. It did go on a little longer than needed. One day it might come to U.S. Hopefully as a double feature with Ultimate Target!